Our cities are full of people, full of needs, and bursting with opportunity. The United Nations estimates that 60% of the world's population will live in cities by 2030. Urban churches have the world on our doorstep. But if we want to see God work in our cities and through our churches, we need to pray. That's where this little book is designed to help. It will enlarge your vision and equip you to pray passionately and powerfully for the salvation and renewal of your city. 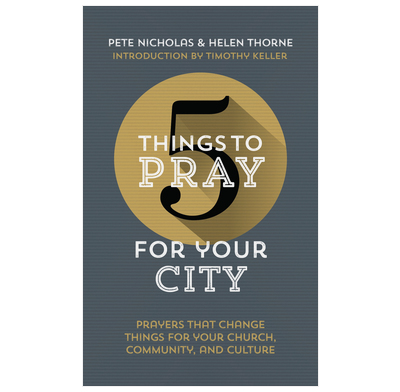 Each chapter takes a passage of Scripture and suggests 5 things to pray for an area of city life. Because when we pray in line with God's priorities as found in his word, our prayers are powerful and effective (James 5 v 16)—and that's a truly thrilling prospect. This book has been developed in partnership with London City Mission and Redeemer City to City, and is flexible enough to be used whatever your urban context. There is no better help and guide I know for the task of praying for your city than this book. This is a wonderfully practical resource to help churches and small groups pray for their city in meaningful and specific ways. Written by two people who are immersed in city ministry, it breathes realism and understanding and gospel expectation. It could be turned to again and again throughout the year with great benefit.